The 11th release in the Divine Reserve series from Saint Arnold Brewing will be released tomorrow, sparking off a quest almost fitting of an Indiana Jones sequel (if Indiana Jones used Twitter instead of a whip). However, Saint Arnold indicated that they have significantly increased production for this one, promising a much better chance of finding it. Divine Reserve #11 is a Double IPA that was brewed with "Simcoe, Columbus and Centennial hops from the Pacific Northwest, resulting in a very citrusy, hoppy beer". It has an ABV of 8.9% with IBU's of 76. This isn't the first Double IPA in the Divine series, but it is the first that was created by Saint Arnold, as the earlier release was the winning entry from the Big Batch Brew Bash. Good luck to those venturing out on their Divine Quest tomorrow. Beaver's is hosting a beer dinner on Monday, May 2nd featuring beers brewed by Independence Brewing. The evening kicks off at 6:00pm with a Beertails Reception (cocktails made with various Independence Brewing beers) which is followed by a 6 course dinner at 7:00pm. Only 50 tickets are available at $75 per person (plus tip) and must be purchased through the Texas Beer Festival website. UPDATE: Canceled - reservations will be refunded by the Texas Beer Festival website. However, there is another Independence beer dinner being held the following Monday, May 9th with Chef Jean-Philippe Gaston (formerly of Kata Robata and Reef) at the Grand Prize Bar. 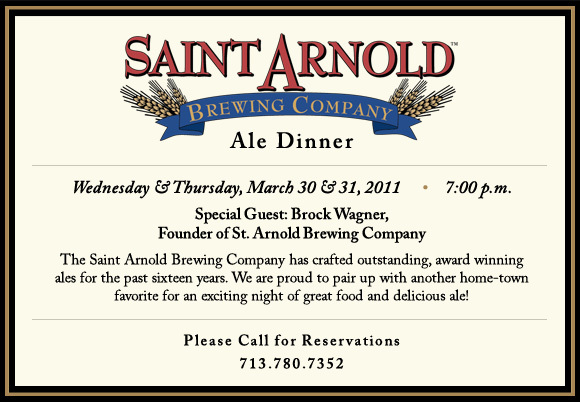 Pappas Bros. Steakhouse is hosting an Ale Dinner featuring beers from Saint Arnold Brewing on Wednesday, March 30th and Thursday, March 31st. 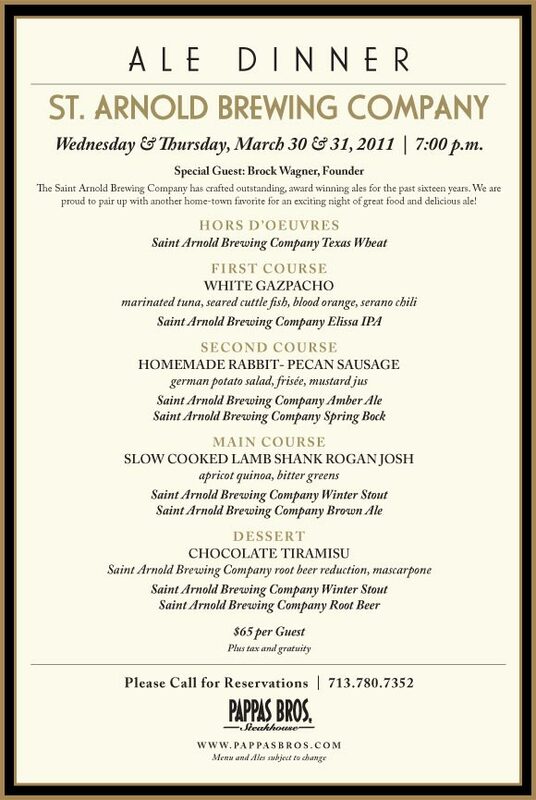 The cost is $65 per person (plus tax and tip) for a six course meal (full menu by clicking on the image below). 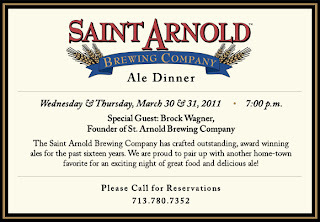 Brock Wagner, the founder of Saint Arnold Brewing, will also be there to answer questions and talk about the beer. Wear something green, but don't drink it. Go with one of the fine Irish-brewed beers that are available here instead. The Houston Press has a good summary of St. Patrick's Day festivities going on at various pubs and bars around town in their Beyond Green Beer post. Just skip the ones serving green beer. The Ginger Man is celebrating everything Texas with a Texas Tasting on Saturday, March 12 starting at 3:00pm. They'll be featuring beers brewed in the Lone Star State which be accompanied by local Texas barbecue. Special cask and vintages beers will be available and Chris Nunez from Real Ale and Mark Nickols from Duff Distributors will also be hand to talk about some of the beers. Another session of Camp Beer has come and gone. This particular installment was titled From Scandinavia With Love, in honour of the beers being served. As always, Cathy did a great job of organizing the event and wrangling up all the beers while Kevin resumed the role of Beer Captain for our voyage through the best beers that Northern Europe has to offer. The session was started with 7 beers from Mikkeller's Single Hop Series. Most beers are typically brewed using a combination of different hops, depending on the flavour, aroma and bitterness that the brewer is seeking for that particular beer. Each of these beers, however, were brewed using just a single hop, allowing you to experience the aroma and flavour profiles unique to that particularly varietal. Cathy managed to get her hands on the ones brewed with East Kent Golding, Centennial, Chinook, Nelson Sauvin, Warrior, Simcoe and Nugget hops. I highly recommend trying them if you have the opportunity, if only for the learning experience. From there, we moved on to another series of beers from Mikkeller, but this time all Oatmeal Stouts brewed with coffee. The Beer Geek Breakfast is the original with a strong yet smooth coffee flavour. The Rauch Geek Breakfast has the addition of smoked malts to impart a bacon flavour and aroma (although, I mainly just got a lot of band-aid taste and smell). 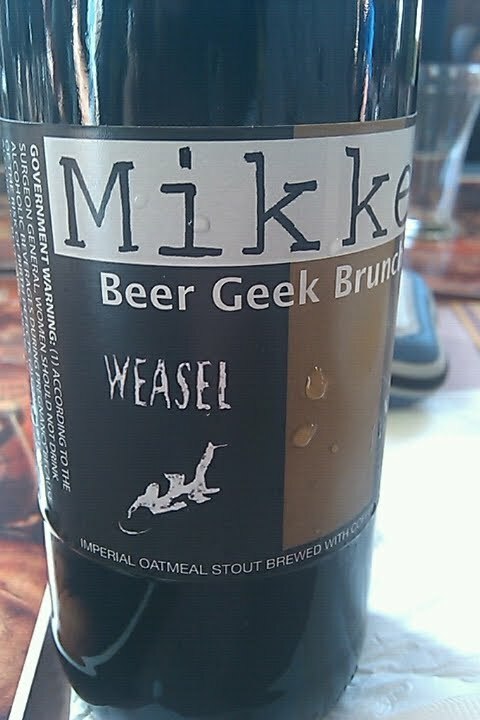 The Beer Geek Brunch Weasel is brewed using Civet Coffee. In case you haven't heard of it, thats coffee brewed with coffee beans that have been eaten and passed through a weasel like creature. Oddly enough, this is some of the most expensive coffee in the world. A little more acidic in the finish then the first two, I'm almost scarred to admit that it was my favourite of this particular series. The next round of beers was from the Nøgne ø brewery in Grimstad, Norway. The Andhrimnir Barleywine and Winter Ale were good, but not overly impressive. 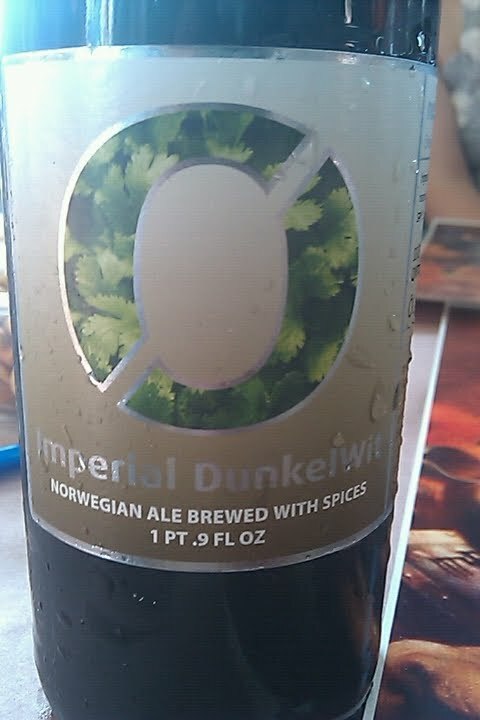 Their Imperial Dunkel Wit however, is a very unique and delicious beer. I first had this beer at the beer dinner at Catalan during Houston Beer Week last fall and it was my favourite from that evening. The bottle served here was from the same batch as the dinner, but the beer had changed considerably. While it was relatively sweet at the beer dinner, that sweetness had subsided and the coriander flavour had become much more prevalent. It would be very interesting to see how this beer continues to change over time. We then moved on to a few beers produced by "four guys brewing in their spare time, on an absurdly small scale". 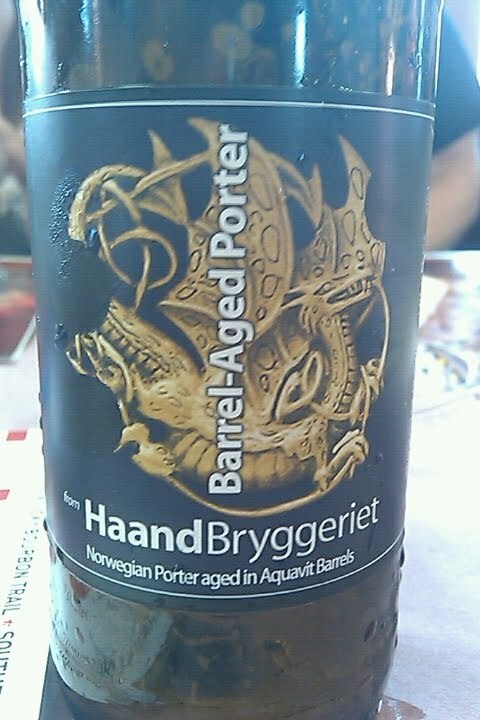 Haandbryggeriet may be small, but they certainly seem to be having fun while producing some very unique beers like their Dark Force, the only Wheat Stout that I've ever seen. Their Barrel-Aged Akevitt Porter is aged in Akevitt barrels, giving it a unique spicy flavour and aroma. The afternoon was finnished off with a couple of beers from Beer Here, a brewery that appears to brew their beer at the Nøgne ø brewery. The Mørke Pumpernickel Porter is a Baltic Porter brewed with rye, but it didn't seem to live up to its name as you would expect it to have a bread-like flavour and aroma. 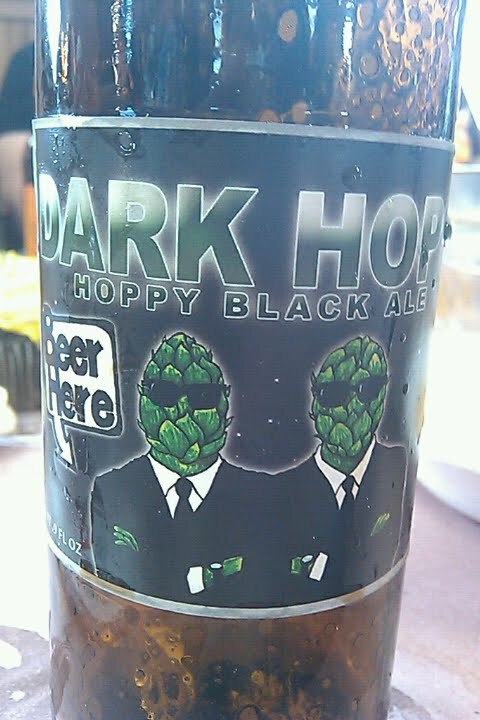 Their Dark Hops, however, was a well-balanced American Style Black IPA (or whatever you prefer to call the style) and one of the few of that style that I've actually liked. For more reviews of the beers that were served and the event itself, also check out Lushtastic and Barleyvine blogs. The next Camp Beer is schedule for June 12th, but the theme is yet to be determined. As usual, start watching for tickets to go on sale at the beginning of May. The glasses are available starting at 5:30pm and only one glass per person with purchase of the beer of the day. As always, the glasses are subject to change and only available while supplies last. Circle Brewing's flyer pretty much says it all. The next new brewery in Austin is set to officially open its doors to the public on March 12th. I'm not all that familiar with the MetroRail in Austin, but I think its pretty cool that you can actually ride it to visit the brewery.